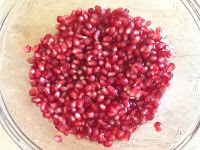 Pomegranates were very likely the first cultivated fruit in ancient times. 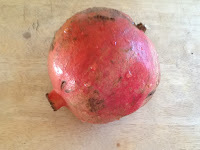 World wide, references to pomegranates can be seen in images and shared throughout cultural traditions. 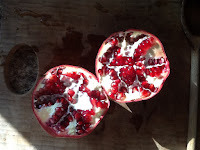 Pomegranates ripen in the fall and are typically harvested from September through February in the Northern Hemisphere. They offer a variety of health benefits, including an abundance of three antioxidant polyphenols; tannins, anthocyanins, and ellagic acid. It’s quite possible they may even be higher in antioxidants than red wine and green tea! Additionally, pomegranates are a good source of fiber and folate, high in potassium, and are also high in Vitamins C, K and E.
I have had people share with me the fact that they don’t eat pomegranates because of the time and mess associated with removing the seeds or arils. 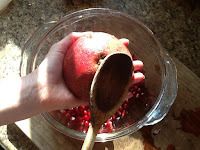 I have seen a few different techniques on how to do this, but most of them take way too long and my kitchen ends up looking like a pomegranate massacre. So, what’s the easiest way to remove the seeds? 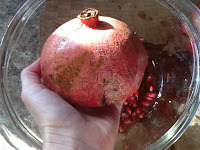 Wash and score the entire circumference of the pomegranate. Hold the fruit in the palm of your hand, cut side over the bowl. While keeping your hand cupped, firmly and evenly tap the entire surface of the fruit. Make sure to hold your hand over the bowl and check that all the arils have been removed. Chuck Norris kicks Roundup to the curb!